Once you have been served with a court summons the next step is to file an answer in order to avoid a default judgment. 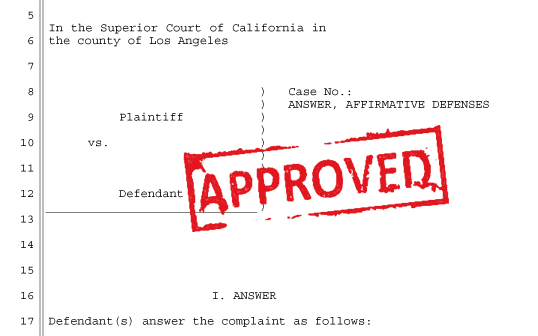 Many people look for a summons template answer form. Even though the internet has slew of all kinds of information, these types of templates are a bit difficult to locate. And when you do find the template, most of them are confusing not to mention that they may be inappropriate for your specific lawsuit. 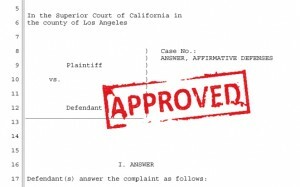 SummonsResponse.com does not have pre-made summons template answer forms, rather we generate the proper for from your responses and tailor it specifically to your civil suit. Be it a collection lawsuit, credit card lawsuit or and other breach of contract lawsuit, we can accommodate you quickly, easily and reliably. Take a look at our video tutorial on the right side of the page for more information.